Hosted or On-Premise remote support software for IT departments and helpdesks. Begin Your Free Trial of PROXY Pro 10 TODAY! With Proxy Networks, you can provide remote desktop and troubleshoot PCs, servers and mobile devices securely. Our encryption, authentication and privileged access management allows our customers to define their own security levels and flexible remote access policies. PROXY Pro is easy to use and designed to fit any budget, making it easy to meet even the most complex remote desktop management needs. We provide remote access software for all platforms, including virtual computers and Thin Clients, regardless of the user’s system. Use our PROXY Deployment Tool and manage host settings anytime to create custom configurations for remote access to your machines, or use our web-based Host on Demand (HOD) for all your clientless remote access connections. Proxy Networks' software supports any system or endpoint, enabling IT professionals to provide remote support immediately and securely both on and off their network. They can also use Chat, File Transfer, Remote Print, create Screen Recordings securely and allow others to join the connection with our Many-to-One connectivity model. 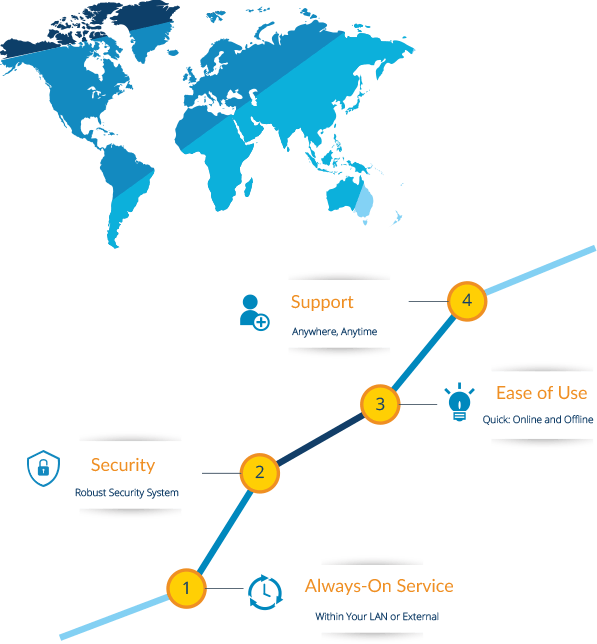 Proxy Networks incorporates the highest standards of security, using SSL and Windows Security Model for authentication. Set your own control permissions to user groups in your Active Directory domain, and control all of your organization’s remote access restrictions with one easy-to-use console. Flexible remote desktop connections to any PC, server, and mobile device in true on-demand fashion lets IT professionals remotely support any device, from any computer. You and your IT support team can now easily remote support and manage connections, resolving issues more efficiently with the Proxy Gateway and Management Console. What are the benefits for your IT team? Remote access and support any PC, server or mobile device, anywhere anytime with just one click. We support Windows platform, Mac, as well as iOS and Android. Unparalleled ease of use: quickly manage and remote desktop machines both on and off your network. Remote desktop complex connections across your organization, supporting various systems at the same time. Protect your organization’s data security with Proxy Network’s robust security system, allowing you to define your organization’s remote access needs. Process complex data to generate inventory of all hardware & software, stop/start/restart services, terminate processes, and other management operations, while simultaneously maintaining secure remote support for end-users. With PROXY Pro, you ensure Always-On Service, remote supporting both attended and unattended machines, regardless as to whether they are within your LAN or external. Download Our Report and See the Top 10 Reasons to Choose Us! "PROXY Pro has a small footprint, doesn't conflict with any other software we use, works over a wide variety of bandwidths and is incredibly simple to use. It's everything an IT professional wants in a software program." "The new remote management software tools in PROXY Pro are very convenient to use. It is very useful to be able to make repairs on-the-spot, without having to make any security exceptions or asking the user to log-off." "PROXY Pro 8 has really paid off for us in just this short period of time. It's already improved our efficiency with just a few crucial uses."